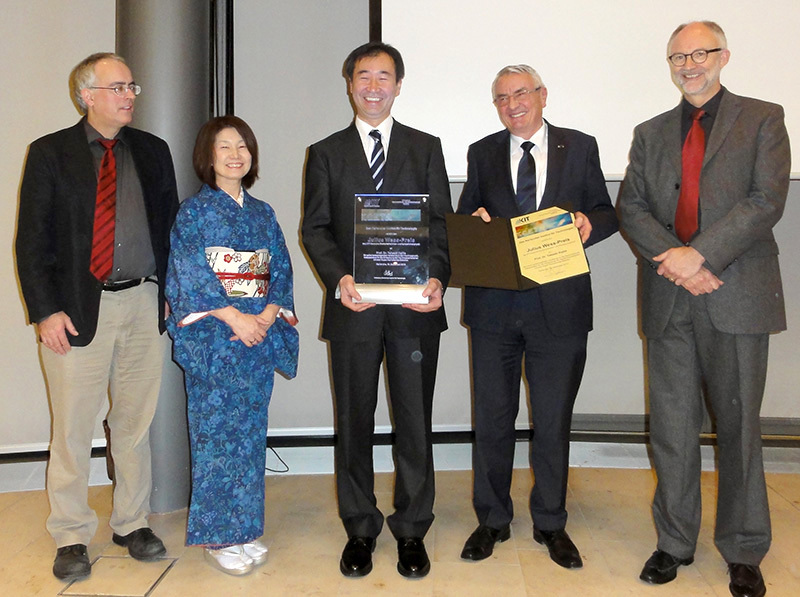 The Julius Wess Award 2013 was dedicated to Takaaki Kajita (ICRR Tokyo) for his outstanding contributions to neutrino physics and especially for his discovery of the neutrino oscillations at the Super Kamiokande detector. Takaaki Kajita has been studied neutrinos at the Kamiokande and later at the Super-Kamiokande experiments since more than 25 years. In 1988 he and his colleagues observed a deficit in atmospheric muon-neutrinos, which could be later explained by the occurrence of neutrino oscillations. Since 1996 he has been leading the studies of atmospheric neutrinos. The discovery of the neutrino oscillations had a groundbreaking impact on the understanding of neutrinos, which have been assumed ssince then to be massless. The oscillations have been the first hint that neutrinos have a mass, even though it is a very small one. KCETA grants the Julius Wess Award for Outstanding Achievements in Elementary Particle and Astroparticle Physics. The research award is granted to elementary particle or astroparticle physicists for outstanding experimental or theoretical scientific achievements, which extend and deepen our understanding of the fundamental laws of nature. 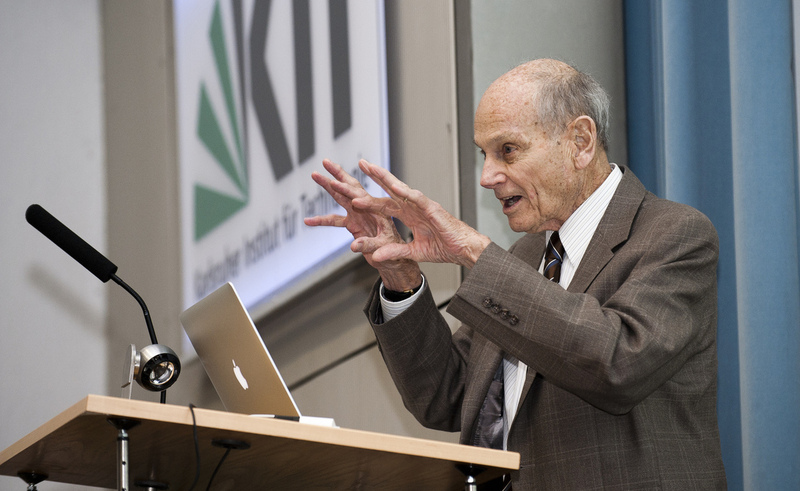 At the opening event of KCETA in November 2008, the award was granted for the first time to Nobel Prize laureate Professor Dr. Frank Wilczek, who had acknowledged the significance of Julius Wess for the theory of elementary particles at a large international conference on supersymmetry in Karlsruhe in summer 2007 already. The dedication of the Award took place on December 19, 2013. 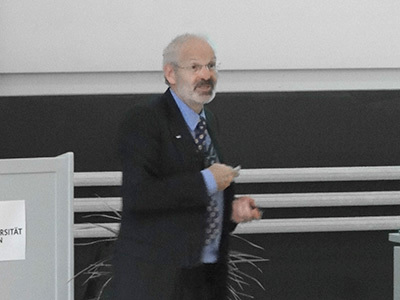 Christian Spiering (DESY) gave a talk on the latest results of the IceCube. 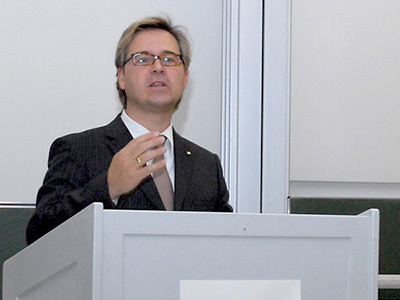 The laudatio was given by Prof. Ulrich Nierste (KIT). The awardee gave an impressive talk about the development of the Kamiokande detectors and the fascinating story of the discovery of neutrino oscillations, which started by accident and where endurance and patience have been crowned with success. On September 18, the Pierre Auger Observatory was awarded by the Argentinian Konex Foundation a special mention as "Highlights of the Decade" for its installation and impacts at Malargüe, in the Mendoza Province, Argentina. Conceived in 1995, the construction of the Pierre Auger Observatory began in 2000 to end on 15/11/2008. The first record of cosmic radiation made ​​by the Pierre Auger Observatory took place on August 2nd, 2001 and marks its birth. It is the largest and most accurate observatory in the world to study high-energy cosmic rays. Extended in between the departments of Malargüe and San Rafael in the Mendoza Province, it is a hybrid detection system with 1 600 surface detectors and 27 fluorescence telescopes, covering an area of ​​3 000 km2. More than 500 scientists and technicians from 100 institutions of 18 countries work with the observatory. In Argentina, the Pierre Auger Observatory is funded by the National Atomic Energy Commission and the Government of the Province of Mendoza. The observations and results obtained with the Observatory have led to over 40 scientific papers and 184 high-impact PhD theses, 14 out of these in Argentina. Its visitor center in Malargüe has received more than 80 000 visitors. The Konex Foundation was created in Buenos Aires, Argentina, in 1980, with the purpose to promote and encourage all sorts of initiatives, works and undertakings of cultural, educational, intellectual, artistic, social, philanthropic, scientific or sport character. The Konex awards were instituted to annually distinguish personalities and most valuable contemporary institutions in all branches that make up the cultural spectrum of Argentina. 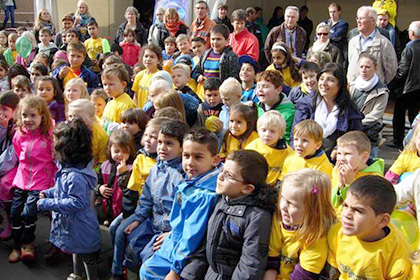 By turn the foundation focus each year on different topics; 2013 was dedicated to "Science and Technology". 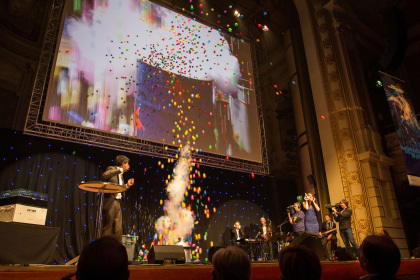 13/12/13 - IceCube awarded the 2013 "Breakthrough of the Year"
The renowned British science magazine Physics World selected the IceCube collaboration’s discovery of the first high-energy cosmic neutrinos as the most significant scientific breakthrough in 2013. Between May 2010 and May 2012, with their one cubic kilometre large detector at the South Pole, the IceCube scientists successfully managed to capture a total of 28 neutrinos with energies greater than 30 teraelectron volts (TeV), two of them with an energy of more than 1000 TeV. Only some weeks ago, the research group published this first evidence of highest-energy astrophysical neutrinos in the scientific journal Science. This success was now awarded by Physics World. "The ability to detect cosmic neutrinos is a remarkable achievement that gives astronomers a completely new way of studying the cosmos," Hamish Johnston, editor of physicsworld.com, justified the selection of the journalists. "The judges of the 2013 award were also impressed with the IceCube collaboration’s ability to build and operate a huge and extremely sensitive detector in the most remote and inhospitable place on Earth." IceCube includes a total of 5 160 photosensitive detectors, the so-called digital optical modules hanging from 86 steel cables which are deployed up to 2.5 kilometres deep in the ice and explore a whole cubic kilometre of Antarctic ice. They measure the weak flashes of light which are generated by the extremely rare collisions of neutrinos with the Antarctic ice. The experiment aims to use the nearly massless neutrinos as unique messenger particles to detect energy-rich events in the universe, for example supernova explosions or other cosmic particle accelerators. After a construction period of seven years in total, the full-size gigantic detector takes data since the end of 2010. The international IceCube team consists of about 275 scientists from eleven countries. In Germany, apart from DESY nine universities participate in the collaboration. The German partners not only developed and built large part of the IceCube optical measurement electronics; also at the data analysis they were among the first ones to hit upon these highest-energy particles. For their theses, two young doctoral students in Aachen and Zeuthen analysed data of the only partly installed IceCube detector and found first hints of a surplus of high-energy neutrinos. One of them is Anne Schukraft who will be awarded the Hertha Sponer Prize 2014 from the German Physical Society for these analyses. Since 2011, all German astroparticle physicists are united in the Helmholtz Alliance for Astroparticle Physics and join forces to investigate the young research field located at the interfaces of astrophysics, particle physics, astronomy and cosmology. Apart from other astrophysical experiments, they are planning to extend their ice cube with PINGU, a densification of the optical modules in the central IceCube area. With this project, the scientists want to increase the measuring sensitivity for low neutrino energies and measure neutrino oscillations. Another idea is to enlarge the existing detector with about 100 additional DOM strings to be arranged in a wide grid around IceCube. This will significantly enhance the measuring sensitivity of the detector for those highest-energy particles which now brought the IceCube scientists the Breakthrough of the Year 2013. More press releases: Helmholtz Association, IceCube/Uni Madison. In one of the episodes of "Sesame Street", the protagonists Ernie and Bert debate on Ernie’s frozen ice cubes which miraculously had disappeared. The story makers could not have guessed that some forty years later, members of a 270 M$ endeavor called IceCube would debate on the miraculous appearance of two events, and that these events would be nicknamed "Ernie" and "Bert" by an imaginative PhD student. Moreover, it would have gone beyond the imagination of the Sesame Street producers that these two events would be interpreted as a first hint to something what scientists call "high-energy extraterrestrial neutrinos". IceCube is a cubic kilometer neutrino telescope installed in the deep Antarctic ice at the South Pole. The detector consists of 86 strings each equipped with 60 light sensors. The sensors record the faint light emitted by relativistic charged particles – including those which are generated in neutrino interactions. IceCube construction was started in December 2004 and completed by December 2010, but data were taken already before completion, year by year, with the strings installed by that time. The ultimate goal of IceCube is to identify individual sources of extraterrestrial energetic neutrinos. These are neutrinos which have not been generated in cosmic-ray collisions in the Earth’s atmosphere (IceCube has recorded more than 100 000 of such "atmospheric neutrinos"), but which have reached us directly from distant cosmic objects like Supernova Remnants or Active Galactic Nuclei. A neutrino signal would provide a water-tight proof that the corresponding object is also a source of charged cosmic rays. Although IceCube and its predecessor AMANDA have improved the sensitivity to energetic neutrinos by a factor 1 000 over the last twelve years, they could not yet pinpoint any individual source. Neutrinos from such "point-like" sources would appear as an accumulation of events from a certain direction of the sky. Instead, the IceCube scientists collected growing evidence that there is a tiny excess of events at the very highest energies which seem to arrive as a diffuse flux from many sources, or even from all directions. High-energy tails in energy spectra were observed repeatedly in analyses of data taken with the 40-string and 59-string configurations of IceCube. These deviations exceeded the predicted spectrum for atmospheric neutrinos by roughly two standard deviations (~2σ). The first step clearly beyond 2σ was made with an analysis of data taken in 2010 and 2011 with the 79-string and 86-string configurations. 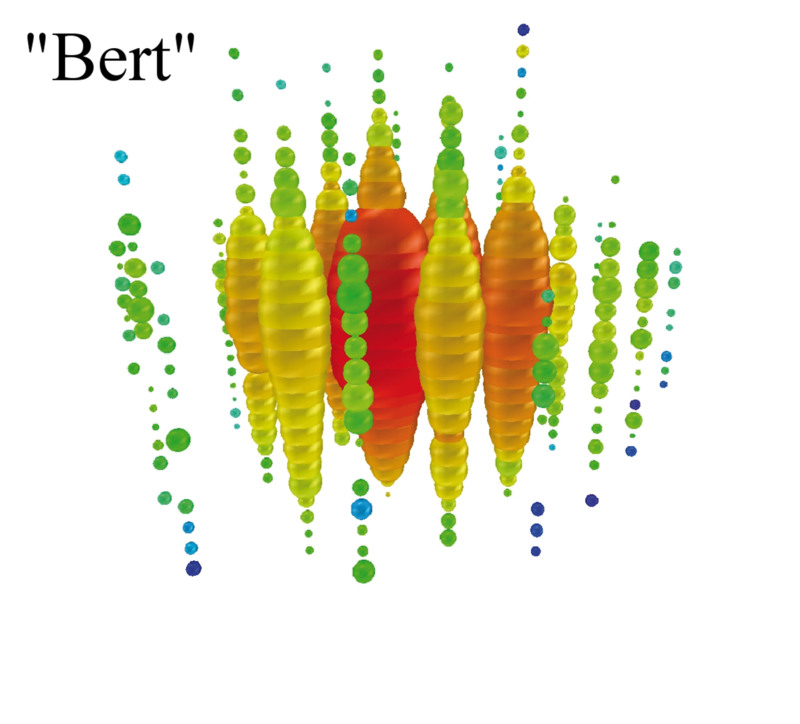 This analysis focused to energies larger than ~500 TeV and provided two events with reconstructed energies of 1.04 and 1.14 PeV (1 PeV = 103 TeV = 106 GeV): "Ernie" and "Bert" (see figure). 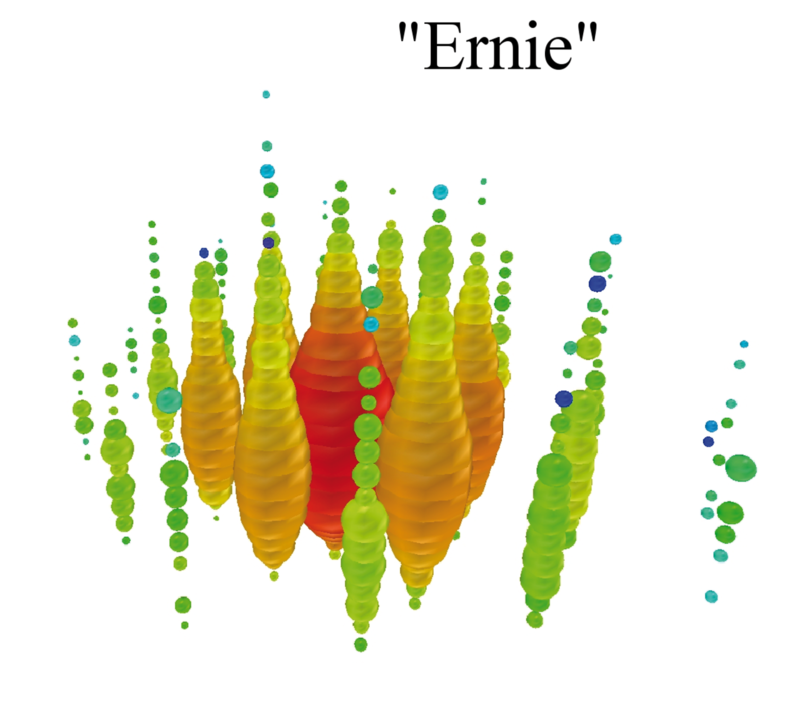 Ernie and Bert represent a 2.8σ excess over the expectation for atmospheric neutrinos1). Motivated by this result, an alternative analysis of the same data was performed. It constrains the event to start in the inner volume of IceCube (using the outer part as veto layer), and at the same time considerably lowers the threshold compared to the first analysis (down to some tens of TeV). Results of this analysis were initially presented on May 14, 2013 at a conference in Madison/USA and are now published in Science2). It provides 28 events with energies deposited in the detector ranging from ~30 TeV to 1.14 PeV. "Ernie" and "Bert" stoically defend their top position in energy. Notably also the events at somewhat lower energies (~30 TeV – ~250 TeV) can hardly be explained alone by atmospheric neutrinos or by muons sneaking unrecognized from above into the detector. The calculated contribution of such "trivial" sources to the total of 28 events is estimated to account for only 11 events. With a statistical significance of 4.1σ, the excess reported in the Science paper is still below the magical benchmark of 5σ. Moreover one cannot fully exclude that the number of atmospheric neutrinos emerging from the decay of short-lived charm particles high in the atmosphere may be somewhat higher than predicted by theory. That would result in an over-estimation of the extraterrestrial contribution. However, Ernie and Bert are meanwhile flanked by a third brother (christened "BigBird"). The IceCube collaboration will release the results of nearly twice the amount of data rather soon. The increase of the statistics will go hand in hand with an improved understanding of systematic effects. No doubt the 5σ-barrier will be broken. To sum up: we see the promised land – 40 years after the first detector of this kind was conceived3). Whereas some months ago we had been reluctant to open the bottles, we are now going to open the fridge and bring out the Champagne! After signing the MoU on GNN: From left to right Christian Spiering (DESY, Zeuthen), Maarten de Jong (Nikhef, Amsterdam), Tyce deYoung (PennState Univ., University College), Zhan-Arys Dzhilkibaev (INR, Moscow), Juan-José Hernandez-Rey (Univ. Valencia), Paschal Coyle (CPPM, Marseille), Olga Botner (Univ. Uppsala), Uli Katz (Univ. Erlangen). The idea to closer link the neutrino telescope projects underwater and ice has been discussed in the international community of high-energy neutrino astrophysicists for several years. Finally, on October 15, representatives of the collaborations ANTARES , BAIKAL , IceCube and KM3NeT have signed a Memorandum of Understanding on a Global Neutrino Network (GNN). The signature act (see picture) was part of the annual common meeting of all four collaborations, this time in Munich. 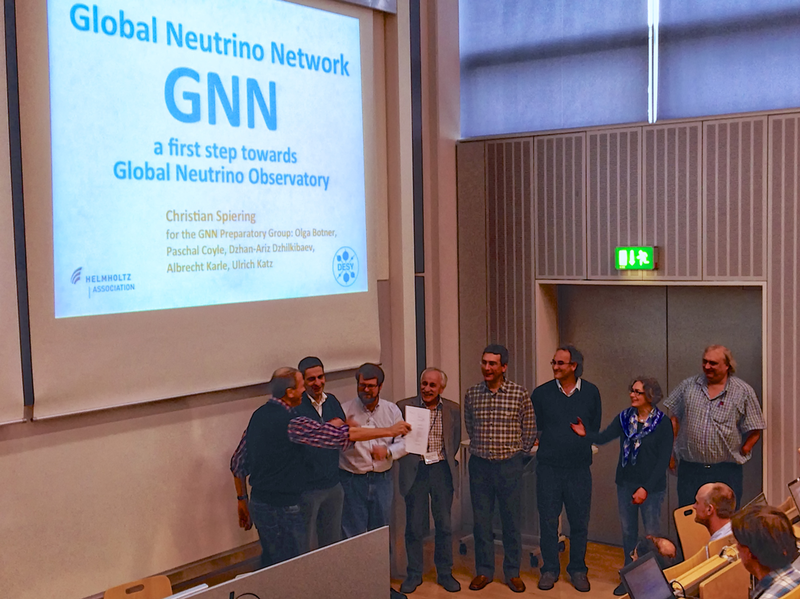 GNN aims for a closer collaboration and a more coherent strategy among the neutrino telescope communities and for exploitation of the resulting synergistic effects. It will serve as a forum for formalizing and further developing the present annual Mediterranean-Antarctic Neutrino Telescope Symposium (MANTS) meetings and biannual international workshop on Very Large Volume Neutrino Telescopes (VLVNT). Goals of GNN include the coordination of alert and multi-messenger policies, exchange and mutual checks of software, creation of a common software pool, establishing a common legacy of public documents, developing standards for data representation, cross-checks of results with different systematics, the organization of schools, and other forms of exchanging expertise, e.g. through mutual working visits of scientists and engineers or by forming ad-hoc advisory committees of members of the four participating collaborations. No doubt, the recent evidence for extraterrestrial neutrinos by IceCube (HAP News: IceCube: Light at the end of the tunnel ) gave wings to GNN and encourages KM3NeT (Mediterranean Sea) and GVD (Lake Baikal) to focus their efforts towards a first Northern cubic kilometer detector and to ask for appropriate funding. At the same time, also IceCube considers extension of its present configuration. Once the Northern projects KM3NeT will have evolved to a comparable scale as IceCube, GNN might be even develop into a more formal consortium, tentatively christened GNO (Global Neutrino Observatory). 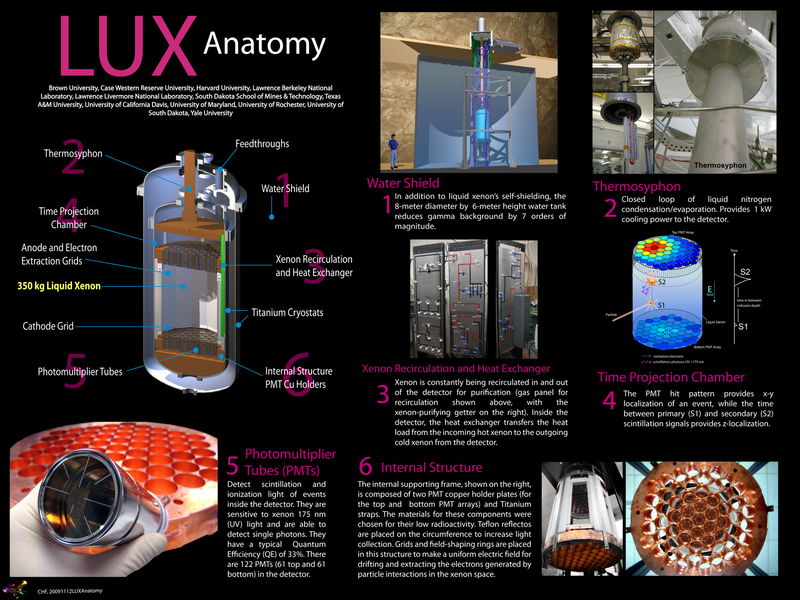 On October 30, the American LUX experiment has announced in a press conference the results of its first phase of measurements. Using 100 kg of ultra-pure liquid Xenon and after only four months of data acquisition the sensitivity has been improved by a factor of three compared to the best results so far published. The LUX WIMP signal region: Events in the 118 kg ducial volume during the 85.3 live-day exposure are shown. The x-axis corresponds to the number of scintillation photo-electron (phe) corrected for different location in the tank, while the y-axis is the logarithm of the ratio of ionization to scintillation signal. Vertical dashed cyan lines show the 2-30 phe range used for the signal estimation analysis. While one could have anticipated based on the target mass the improvement of sensitivity by LUX, the excellent background reduction which was achieved and the excellent performance of the LUX detector, even at lower energies, are impressive results. This allowed to largely exclude experimental hints at low WIMP masses. Taken the DAMA evidence, in the LUX experiment a signal of at least 1000 events should have appeared, independently of the uncertainties in the astrophysical parameters and the question of whether the interaction occurs just to nuclei or also to electrons in the atomic shells. Even without distinction of nuclear recoils LUX measured only 160 events. The same applies to the other 'Low Mass WIMP evidences'. Considering this excellent result after only four months, we can expect further improvements for the near future. If dark matter consists of weakly interacting massive particles - WIMP - (in a mass range up to several hundred GeV), it is about to be experimentally detected in the coming years. 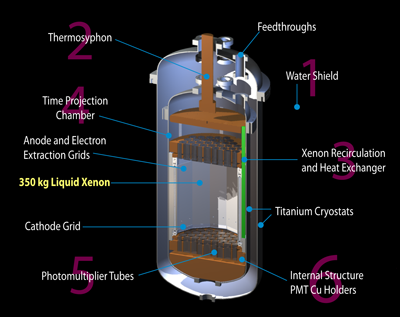 Particle interactions in liquid xenon generate both 175 nm ultraviolet photons and electrons. The photons are immediately detected by two arrays of 61 photomultiplier tubes located at the top and bottom of the detector. These prompt photons are called the S1 signal. The electrons generated by the particle interaction are drifted upwards towards the xenon gas phase with an electric field in the liquid xenon. The electrons are extracted out of the liquid and into the gas by using a stronger electric field at the liquid xenon surface. In the gas, the electrons produce electroluminescence photons that are detected by the photomultiplier tubes as the S2 signal. The pair of an S1 and a subsequent S2 signal constitutes an individual particle interaction in the liquid xenon. The LUX detector is a time-projection chamber (TPC), it uses the time between the S1 and the S2 signals to find the depth of a given particle interaction. 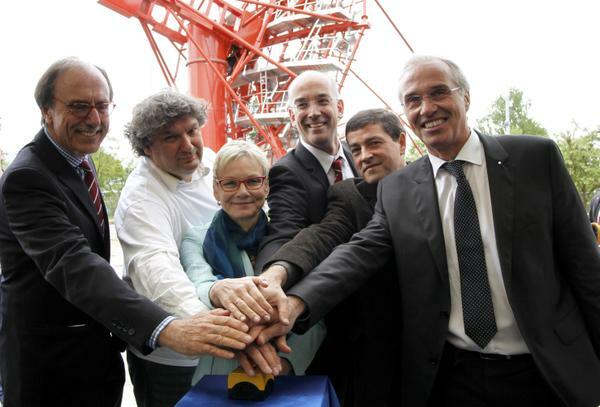 On October 17, 2013 the Center for Particle Physics Siegen (CPPS) was solemnly opened. It is the first center founded by the Faculty IV, University of Siegen and combines the activities in the field of particle physics at the University of Siegen. The founding board of the CPPS includes with Prof. Peter Buchholz and Prof. Markus Risse two Members of the Helmholtz Alliance for Astroparticle Physics. A special feature of the center is the fact that the proportion of experimental and theoretical physics is almost equally strong. The founding board of the CPPS consists of nine scientists, four of them being experimentalists and five being theoretical particle physicists. In experimental particle physics there is research with terrestrial as well as with cosmic particle accelerators. This includes the development of the detectors, and the analysis and physical interpretation of the data. There is a focus on astroparticle physics with the Siegen participation in the Pierre Auger Observatory in Argentina which studies the properties of the highest energy cosmic rays. Theoretical physics research focusses especially on flavor physics, on quantum chromodynamics and on the properties of the heaviest quarks, the most elementary parts of protons and other hadrons. Further important objectives of the Centre are to enhance the training of undergraduate and graduate students, as well as the promotion of scientific exchange by establishing research seminars and the increased invitations of foreign scientists for long-term stays at the center. 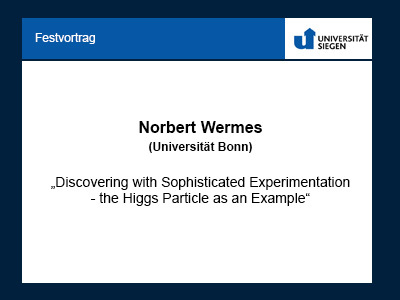 The inauguration included a lecture of Prof. Claus Grupen on the 40 years of the particle physics in Siegen and a testimonial lecture by Prof. Norbert Wermes (University of Bonn), "Discovering with sophisticated experimentation - the Higgs as in example". As chairman, Prof. Ivor Fleck presented the participants and the research topics of the CPPS. 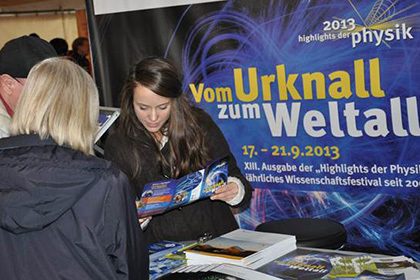 More than 30,000 visitors were attracted by the science festival "Highlights der Physik 2013" hosted in downtown Wuppertal. This number makes it the second-largest event in its 13 year old history. This year's motto "Vom Urknall zum Weltall" (from the Big Bang to the Universe) reflects the fact that the faculty of physics at the University of Wuppertal is strongly engaged in high energy physics experiments at CERN's LHC as well as in Astroparticle Physics experiments, like the Pierre Auger and Ice Cube Observatories operated in Argentina and at the South Pole, respectively. 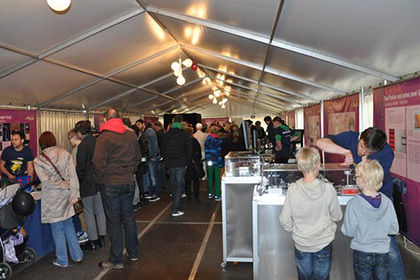 The centerpiece of the five days festival was a large pavilion erected in front of the town hall where visitors could inform themselves at first hand about current research projects in these and related fields of science. 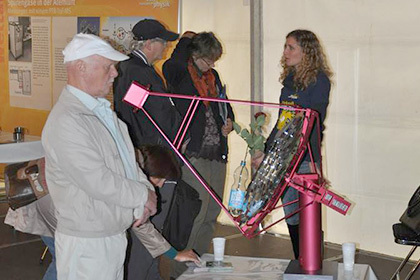 The large variety of exhibits coming from all over Germany, often with opportunities for live observations and possibilities for own experimenting, impressed people of all generations. 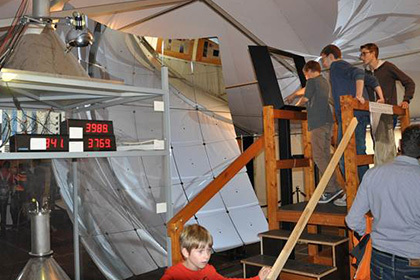 The largest exhibit was a 12 m2 large mirror telescope from the Pierre Auger Observatory. More than 500 scholars from eleven national states took part in a competition "exciting physics" where special constructions were presented for addressing different kinds of posed problems. The opening show, moderated professionally by Ranga Yogeshwar, was attended by more than 1500 guests and the free tickets were out of print after less than 30 minutes. 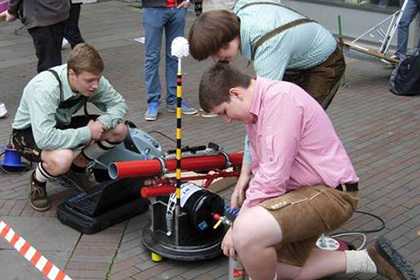 The festival program included also an "Einstein Slam" where scientists competed against each other in presenting their research most attractively in at most 10 minutes, evening talks given by renown scientists, complementing morning talks addressed specifically to pupils, and specific public question times with researchers addressing various topics related to careers and science. The event was sponsored by the BMBF, DPG, and University Wuppertal with further partners being the Wilhelm and Else Heraeus- and Klaus Tschira foundations, the Wuppertal Junior-Uni, the internet platform „Welt der Physik“, the Oerlikon Leybold Vacuum GmbH, „Westdeutsche Zeitung“, and „Radio Wuppertal“. Next years Highlights will take place in Saarbrücken. Information leaflets were given to the visitors. Coincidences of muons measured by KASCADE Detectors (in front) and Auger telescope (at back). 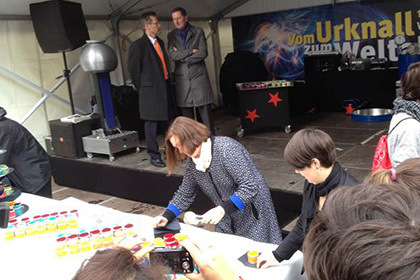 Wuppertal's most delicious "Elementar-Teilchen" were handed out by DPG president Johanna Stachel. In the office of Prof. Dr. Loehe (left), with Prof. Dr. Etchegoyen (middle) and Prof. Dr. Bluemer (right). July 22nd, Prof. Dr. Etchegoyen, director of the Institute for Detector Technology and Astroparticle Physics (ITeDA) in Buenos Aires, received officially his Helmholtz International Fellow Diploma from the hands of Prof. Dr. Loehe, Vice President for Research and Information at KIT, on the left, and Prof. Dr. Bluemer, head of the KIT Center Elementary Particle and Astroparticle Physics (KCETA), on the right. with start energy E= 1000 eV. 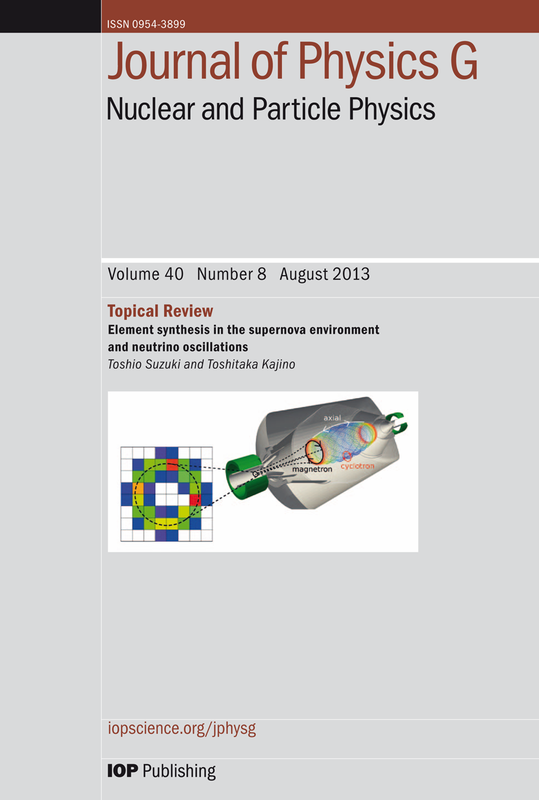 The article "Validation of a model for Radon-induced background processes in electrostatic spectrometers" for the KATRIN experiment of freshly-graduated-of-today Dr. Nancy Wandkowsky is June 2013 'Publisher's pick' of the Journal of Physics G. One of the picture of this paper (top picture on left) even made the cover of the August issue (bottom picture on left). This model of the GERDA experiment shows the onion-like structure which suppresses interfering signals from the environment. The germanium diodes in the center of the cryostat filled with liquid argon (–186°C) are to a larger scale. 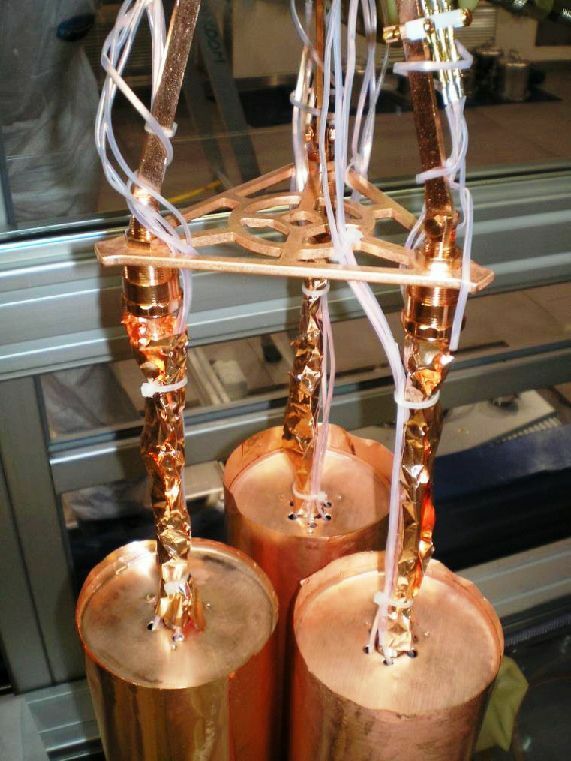 (Credit: MPI for Nuclear Physics) Germanium detectors wrapped by a high-purity copper foil for radiation shielding. Neutrinos are the most elusive particles having extremely weak interactions with all other particles. They have rather unusual properties and are even expected to be identical with their own antiparticles. So far this property is, however, not experimentally verified even though many studies of neutrinos over the last 60 years have already boosted our understanding of elementary particle physics. Now scientists of the GERDA collaboration obtained new strong limits for the so-called neutrino-less double beta decay, which tests if neutrinos are their own antiparticles. The result rules out an earlier claim and has various important implications for cosmology, astrophysics and particle physics and it adds information about neutrino masses. In GERDA germanium crystals are both source and detector. Ge-76 has an abundance of about 8% in natural germanium and its fraction was therefore enriched more than 10-fold before the special detector crystals were grown. Searching for a needle in a haystack is trivial compared to the detection of double beta decay, since environmental radioactivity is a background occurring at a rate at least a billion times higher than double beta decay. The GERDA detector crystals and the surrounding detector parts were therefore very carefully chosen and processed. The observation of the extremely rare process requires in addition very delicate techniques to further suppress backgrounds from cosmic particles, natural radioactivity of the surroundings and even the experiment itself. The scientists met this challenge by mounting the detectors in the center of a huge vessel that is filled with extremely clean liquid argon, lined by ultrapure copper, which in turn is surrounded by a 10-meter-diameter tank filled with highly pure water; the whole located underground below 1 400 meter of rock. Combining all these innovative and pioneering techniques it was possible to reduce the background to unprecedented levels. Data taking started in fall 2011 using 8 detectors the size of a tin can and weighting two kilograms each. Subsequently, 5 additional newly designed detectors were commissioned. Until recently, the signal region was blinded and the scientists focused on the optimization of the data analysis procedures. The experiment has now completed its first phase with 21 kg∙years of data accumulated. The analysis in which all calibrations and cuts had been defined before the data in the signal region were processed, revealed no signal of neutrino-less double beta decay in Ge-76 which leads to the world’s best lower limit for the half-life of 2.1x1025 years. Combined with information from other experiments, this result rules out an earlier claim for a signal by others. The new results from GERDA have interesting consequences for the knowledge on neutrino masses, extensions of the standard model of elementary particle physics, astrophysical processes and cosmology. The GERDA (GERmanium Detector Array) experiment, which is operated at the Laboratori Nazionali del Gran Sasso underground laboratory LNGS) of the Istituto Nazionale di Fisica Nucleare in Italy, is aiming to resolve the question whether neutrinos are in fact their own antiparticles, and to determine their mass. GERDA looks for so-called double beta decay processes in the germanium isotope Ge-76 with and without the emission of neutrinos, the latter being a consequence of the Majorana properties. In normal beta decay, a neutron inside a nucleus decays to a proton, an electron and an antineutrino. 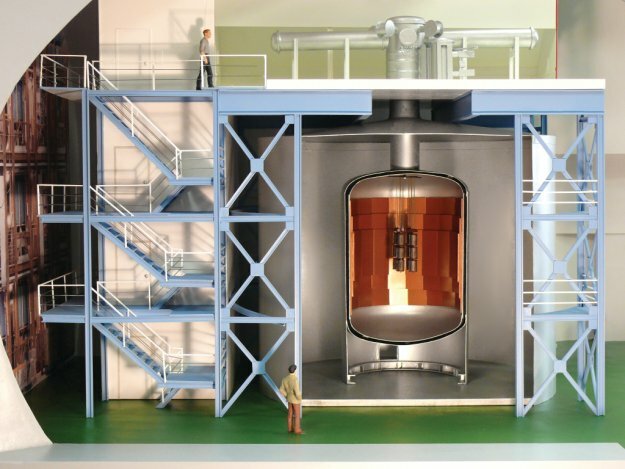 For nuclei like Ge-76, normal beta decay is energetically forbidden, but the simultaneous conversion of two neutrons with the emission of two antineutrinos is possible and has been measured by GERDA recently with unprecedented precision. This is one of the rarest decays ever observed with a half-life of about 2x1021 years, which is about 100 billion times longer than the age of the Universe. If neutrinos are Majorana particles, neutrino-less double beta decay should also occur at an even lower rate. In this case, the antineutrino from one beta decay is absorbed as neutrino by the second beta-decaying neutron, which becomes possible if neutrinos are their own antiparticle. GERDA is a European collaboration with scientists from 16 research institutes or universities in Germany, Italy, Russia, Switzerland, Poland and Belgium. The participating institutes in Germany are the Max-Planck-Institute for Nuclear Physics in Heidelberg (group of Prof. M. Lindner), the Max-Planck-Institute for Physics (group of Dr. B. Majorovits) and the Technical University in Munich (group of Prof. S. Schönert), the universities of Tübingen (group of Prof. P. Grabmayr) and Dresden (group of Prof. Prof. K. Zuber). The GERDA experiment is supported in Germany by the Max Planck Society (MPG) and the German Federal Ministry for Education and Research (BMBF), the German Research Foundation (DFG) via the Excellence Cluster. Successful cosmological models hold that dark matter accounts for most of the matter effects we observe in our Universe. WIMPs, weakly interacting massive particles, impervious to electromagnetic and strong nuclear interactions, are the category of dark matter candidates with the most devotees among scientists. WIMPs are also predicted by supersymmetric extensions of the Standard Model of particle physics. These models have credence with the physics community but there is no experimental evidence that identifies the composition of dark matter to date. New results from the IceCube Collaboration set up new limits on the cross section as a function of the WIMP mass for annihilation into and . This is the first search for dark matter annihilation in nearby galaxies and galaxy clusters using a sample of high-energy neutrinos detected with the IceCube Neutrino Observatory during the 2009–2010 data-taking period, when the telescope was running in its 59-string configuration. Big Bang. The Fermi results strongly constrain the mass region below 1 TeV, while the results of IceCube provide valuable information for masses above. In a recent analysis looking for WIMPs trapped in the Sun, the IceCube Collaboration set the most stringent upper limits yet on the mass for the spin-dependent hard decay modes. The new search discussed here looks for dark matter in extragalactic sources, such as the Virgo and Coma galaxy clusters, the Andromeda galaxy, and several dwarf galaxies. Despite these measurements, neutrinos reaching IceCube do not show any significant excess from these regions. The measured fluxes, however, set competitive limits for the velocity averaged self-annihilation cross section above 1 TeV. and on arXiv.org:1307.3473 "An IceCube search for dark matter annihilation in nearby galaxies and galaxy clusters," IceCube Collaboration: M.G. Aartsen et al., submitted to Physical Review D.
Cosmic rays, high-energy particles created in and around extreme cosmic objects, are known to reach energies above 1011 GeV. How and where they are produced, though, have been a science puzzle for several decades now. The more we learn about their energy spectrum and chemical composition, the closer we come to understanding how cosmic rays are accelerated and how they propagate from their original sources. Of particular interest is the energy range above 100 TeV because the transition from galactic to extragalactic cosmic rays is expected to occur in this region. The IceCube Collaboration publishes today a new measurement of the all-particle cosmic ray energy spectrum in the energy range from 1.6 PeV to 1.3 EeV using data from IceTop, the surface component of the IceCube Neutrino Observatory. The measured spectrum exhibits clear deviations from power law behavior. A spectral hardening is observed around 20 PeV and a steepening around 130 PeV. 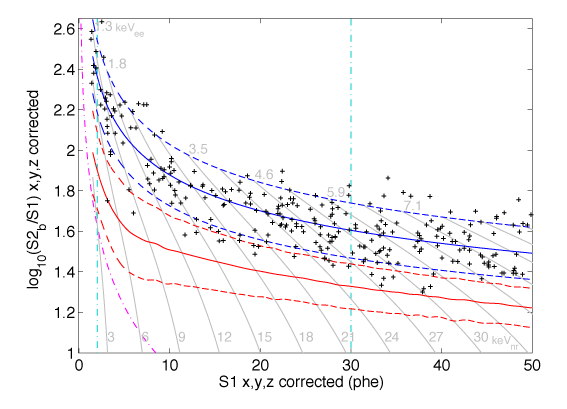 These results confirm with better resolution deviations already reported by several experiments. IceTop 73 spectrum in the energy range from 1.6 PeV to 1.3 EeV in comparison to other recent experiments. Shaded band shows the systematical errors. (credit: IceCube Collaboration) The cosmic-ray spectrum follows, approximately, a sequence of 3 power laws, separated by a feature dubbed the "knee" and the "ankle", respectively. Deviations from a simple power law between the knee and the ankle reflect the transition from galactic to extragalactic cosmic rays. The figure on left compares the IceTop cosmic ray spectrum with several other experiments. The spectrum steepens at the “knee” around 4 PeV, which is generally interpreted as the beginning of the end of the galactic population. Below the knee, cosmic rays are galactic in origin, while above that energy particles from more distant regions in our Universe become more and more likely. The observed deviations from a simple power law spectrum between the knee and the “ankle” (around 4 EeV), now confirmed by the IceCube Collaboration, reflect the transition from galactic to extragalactic populations in ways that remain to be understood. The evolution of the chemical composition of cosmic rays in this region is the next big step required to clarify this transition. and on arXiv.org:1307.3795 "Measurement of the cosmic ray energy spectrum with IceTop-73," IceCube Collaboration: M.G. Aartsen et al., submitted to Physical Review D.
The German astroparticle physicist Prof. Dr. Johannes Blümer, senior member of the Pierre Auger Observatory and spokesperson of the KIT Center Elementary Particle and Astroparticle Physics (KCETA) was awarded Doctor Honoris Causa of the Universidad Nacional de San Martín (UNSAM) by its rector Carlos Ruta in a ceremony that took place in Buenos Aires, Argentina. German and Argentinean scientists, academic authorities, professors and students were gathered to welcome Johannes Blümer, who was awarded the highest honorary title of UNSAM "for outstanding support and dedication to the development of astroparticle physics in the country, where he participated in major joint projects, and the training of international young researchers ". Prof. Dr. Alberto Etchegoyen, director of the Institute of Technology and Astroparticle Detection (ITeDA), Buenos Aires, and Helmholtz International Fellow, gave the traditional praise of honor. He mentioned the brilliant career of Prof. Dr. Blümer, his tremendous effort to develop astroparticle physics worldwide, and particularly in Argentina, and his devotion to teaching. 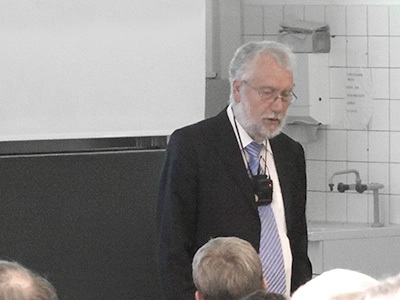 He also highlighted his work as spokesperson of the Helmholtz Alliance for Astroparticle Physics (HAP) and the close connection between the UNSAM and the Karlsruhe Institute of Technology (KIT). Since May 2013 a dual degree PhD program has been set up between both universities. The ceremony was followed by a two-day “German-Argentinean astroparticle workshop”, distributed between the Universidad Nacional de La Plata (UNLP) and the Universidad de Buenos Aires (UBA). 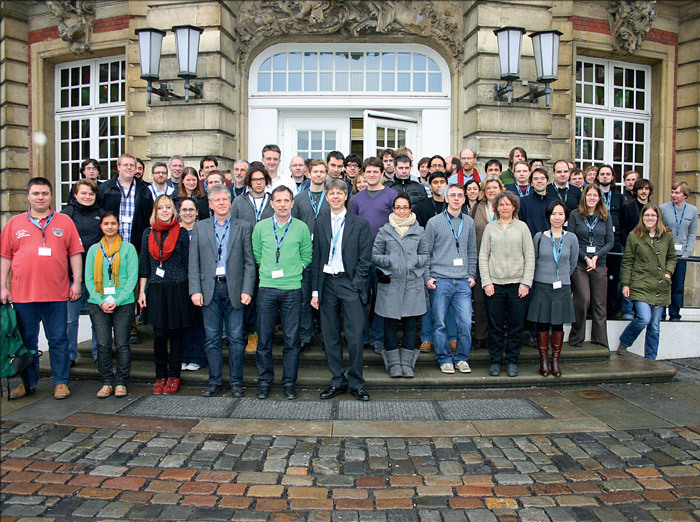 The HAP Dark Matter 2013 meeting drew 100 participants. The first meeting dedicated exclusively to dark-matter theory and experiment in Germany was held earlier this year at the University of Münster. Made possible through the generous financial support of the Helmholtz Alliance for Astroparticle Physics (HAP), the conference – HAP Dark Matter 2013 – was co-organized by Michael Klasen of Münster and Klaus Eitel of the Karlsruhe Institute of Technology (KIT). The 100 participants included senior German dark-matter scientists, many postdocs and students, as well as experts from neighbouring countries such as Belgium, Denmark, France, the Netherlands, Spain, Sweden, Switzerland and the UK. The scientific programme aimed at a complete coverage of all aspects related to dark matter and ranged from astronomical observations through experimental searches to theoretical interpretations and tools. As the first speaker, Jürg Diemand of Zurich presented fascinating numerical simulations of galactic structures by the Via Lactea collaboration. Thomas Reiprich of Bonn and Justin Read of Surrey followed up with the prospects for galaxy-cluster cosmology using X-ray telescopes, with determinations of the local dark-matter density from stellar kinematics, while Eva Grebel of Heidelberg gave an overview of dark-matter-dominated dwarf galaxies. 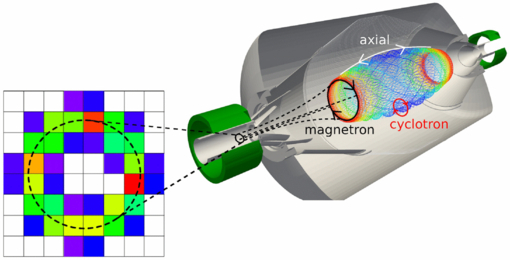 Experimental results were reported from: direct searches, for example, with the XENON experiment, described by Christian Weinheimer of Münster; indirect searches with the Fermi Gamma-ray Space Telescope, by Johann Cohen-Tanugi of Montpellier; and the LHC experiments, by CERN’s David Berge, CERN. While none of these searches can yet conclusively provide positive evidence, some, as Thomas Schwetz-Mangold of Heidelberg explained, do leave room for speculation on relatively light dark-matter particles. Participants were also curious to see the preparations for the XENON1T experiment, visible during several laboratory tours offered by Ethan Brown of Münster. With increasing experimental sensitivity and precision, the need for precise theoretical and numerical tools is now evident. This was addressed in talks by Manuel Drees of Bonn and Andrzej Hryczuk of Munich on the so-called Sommerfeld enhancement. Full next-to-leading order calculations, presented by Karol Kovarik of KIT, are integrated into programmes such as micrOMEGAs and DarkSUSY, described by Geneviève Belanger of Annecy and Torsten Bringmann of Hamburg, respectively. Whether dark matter is supersymmetric, as discussed by Laura Covi of Göttingen and Béranger Dumont of Grenoble, or not, as Steen Hannestad of Aarhus, Andreas Ringwald, DESY, and many others argued, still has to be decided. This might be possible at a second HAP Dark Matter meeting, which many of the participants eagerly demanded. Karl Eugen Huthmacher, Stefan Schlenstedt, Sabine Kunst, Christian Stegmann, Manel Martinez and Helmut Dosch (from left) press the button to start the prototype. The CTA prototype at Berlin Adlershof Science Park. 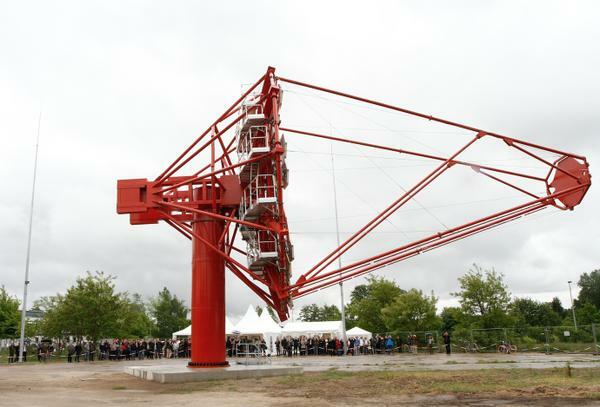 On May 22nd, 2013, at the Berlin Science Park Adlershof, DESY commissioned the first telescope prototype of the Cherenkov Telescope Array (CTA). In an inauguration ceremony, Professor Sabine Kunst, science minister of the German federal state of Brandenburg, Dr. Karl Eugen Huthmacher, head of department at the German Federal Ministry of Education and Research BMBF, Professor Helmut Dosch, chair of the DESY board of directors, and Professor Christian Stegmann, head of the DESY institute in Zeuthen, jointly commissioned the prototype. In the coming months, the fully functional full-scale model of the medium-sized of the planned three CTA telescope types will be used to test all functions for future operation at the CTA facility. The CTA, developed in an international cooperation, is a planned ensemble of different-sized telescope types which will measure high-energy cosmic gamma rays. Scientists will use it to explore the universe for cosmic particle accelerators, e.g. supernova explosions, binary star systems or active galactic nuclei. “The Cherenkov Telescope Array will observe thousands of these objects with unprecedented sensitivity and substantially enhance our understanding of the universe,” said Professor Christian Stegmann. “It will be the gamma astronomy observatory of the future.” DESY is the largest group within the international project and is responsible for design and construction of the medium-sized telescope with a mirror diameter of about 12 metres. “With our comprehensive participation in CTA, we continue to extend the central role of DESY in Zeuthen in astroparticle physics in Germany and worldwide,” said Professor Helmut Dosch. “Over 1000 scientists and engineers from over 25 countries from all around the globe are working since 2006 towards CTA. The DESY team lead by Stefan Schlenstedt has made an outstanding work in preparing this prototype and getting it operational,” underlined Professor Manel Martinez (IFAE Barcelona), spokesperson of CTA. The prototype in Berlin-Adlershof was designed and built by DESY. It will be used to test and optimise the drive and safety systems of the telescope in motion. Simultaneously, it includes the measuring of the mechanical properties of the telescope, e.g. vibrations and deformations, the star light focussing of the camera during mirror adjustment and accurate telescope alignment to a celestial object. The German contribution to the construction costs amounts to about 50 million euros. By including the project into the roadmap, the BMBF declared their readiness to in principle provide funds for the construction of CTA. Apart from DESY, the German contribution is financed by the Max Planck Society and particularly by the BMBF which also supports German universities in the project. suspended in a cubic kilometer of ice at the South Pole. The international IceCube Collaboration has presented at the IceCube Particle Astrophysics Symposium (IPA) in Madison, USA, recent results of their search for astrophysical neutrinos. Between May 2010 and Jun 2012 28 neutrinos with energies above 30 tera-electron volts (TeV) were registered with the IceCube neutrino detector, including two events with energies just over 1 peta-electron-volts (1 PeV = 1,000 TeV). 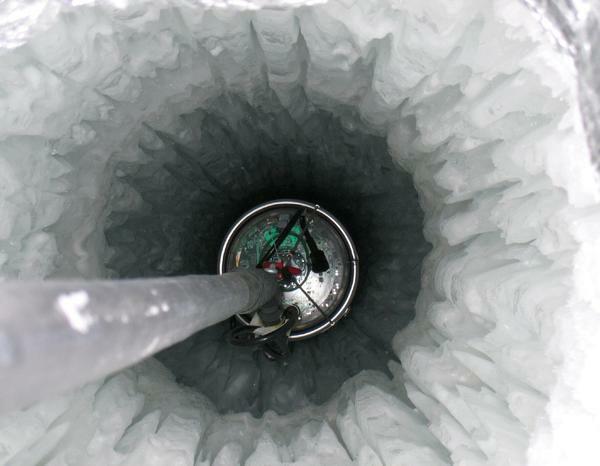 Thus the astroparticle experiment, which consists of about 5,000 light detectors frozen into South-Pole ice, has achieved a significant advance in the search for extraterrestrial neutrinos. "A peta-electron-volts is more than a thousand times higher than the energy of neutrinos that have ever been produced using of particle accelerators on Earth," said the IceCube researcher Dr. Christian Spiering of DESY, who was also the scientific coordinator of IceCube "The number of 28 events is difficult to reconcile with what is expected for neutrinos produced by cosmic rays in the atmosphere. "The IceCube detector consists of a regularly spaced array of 5,160 photomultiplier tubes buried between 1450 to 2450 meters below the surface of the South Pole ice. With them, the researchers can prove neutrinos are created as products of galactic cosmic explosions or other processes. The neutral particles interact only very weakly with matter and are therefore ideally suited to carry information about distant events over large distances. If a neutrino is stopped when penetrating polar ice, it creates a faint bluish light, which is recorded by the detectors. However, neutrinos can also be produced by cosmic rays interacting with the Earth's atmosphere. The number of such "atmospheric neutrinos", recorded by the IceCube observatory, is of the order of hundreds of thousands - but these neutrinos have much lower energies. The first indication of extraterrestrial high-energy neutrinos happened in April 2012 with the unexpected discovery of two PeV events. The IceCube researchers affectionately nicknamed these two unusual events "Ernie" and "Bert". A thorough analysis of these events was presented in April 2013 and submitted to the journal Physical Review Letters for publication. The results presented on May 15, 2013 has now further promoted 26 events with energies above 30 TeV, which is more than what is expected for neutrinos produced in the Earth's atmosphere. "We experience maybe the first hours of neutrino astronomy," said Dr. Markus Ackermann, head of the neutrino astronomy group at DESY in Zeuthen "In the coming years we expect further scientific breakthroughs with IceCube. And with these results from IceCube, we want soon to make precision measurements in neutrino physics and neutrino astronomy with the potential expansions Pingu and IceCube++." The neutrino telescope IceCube is the largest particle detector in the world and consists of a cubic kilometer of ice at the South Pole, which is interspersed with highly sensitive light sensors. The tracks of outer-space neutrinos recorded by the detectors give information about distant events such as supernova remnants, gamma ray bursters, and active galaxies. The international IceCube team consists of some 260 scientists from 36 research institutions of 8 countries. From Germany 9 research institutions are involved. The German participants have contributed to almost a quarter of the optical modules an essential part of the receiver electronics at the ice interface. The German contribution of 20 M € was supported by the Federal Ministry of Education and Research (BMBF), the Helmholtz Association, the German Research Foundation (DFG) and through the basic equipment of the participating universities. TU Munich (group Prof. E. Resconi), University of Wuppertal (group of Prof. K. Helbing). KIT’s KASCADE-Grande experiment has yielded the important result that a characteristic bend in the energy spectrum of high-energy cosmic rays, also called “knee”, is located at different energies for light and heavy primary particles. The position of the knee appears to vary with the charge of atomic nuclei: KASCADE-Grande detected the “iron knee” at an energy that was 26 times higher than the knee in the spectrum of hydrogen nuclei. Latest findings of the KASCADE-Grande experiment reveal a flattening (also called “anti-knee” or “ankle”) of the spectrum of light primary particles above an energy of 1017 electron volts. This structure indicates the existence of a new, now extragalactic component of cosmic rays. This important result in high-energy astrophysics was published recently by the scientists in the “Physical Review D” journal. 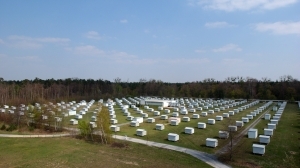 KASCADE-Grande was a measurement field for cosmic rays on the premises of KIT Campus North. “With KASCADE-Grande, we measured showers of secondary particles produced by primary particles of cosmic origin at energies of 1014 to 1018 electron-volts,” explains Dr. Andreas Haungs who coordinates the KASCADE-Grande project at KIT. 1018 electron-volts: This exceeds the energy reached by the largest particle accelerators on Earth by several orders of magnitude. The worldwide known and acknowledged experiment was shut down last year. But current analysis of the full data set again yielded a scientific highlight. The flux of cosmic rays, i.e. of primary particles that can probably be found anywhere in the universe, decreases strongly with increasing particle energy. Slightly above an energy of 1015 electron volts, the “slope” of energy decrease changes: This leads in a bend in the spectrum, the “knee” of cosmic radiation. KASCADE-Grande demonstrated that the knee occurs at different energies for light and heavy elements and that this difference is related to charge. But where does the knee come from and why does its cause depend on the charge of the cosmic particle? This might be explained by magnetic fields in the vicinity of cosmic accelerators. Towards higher energies, they work more effectively for particles of higher charge. Moreover, our galaxy possesses a magnetic halo that prevents most of the particles from leaving our Milky Way. 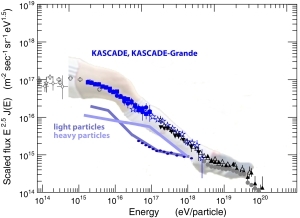 It was concluded from the results of KASCADE-Grande that the primary particles of cosmic rays can be generated and stored in our Milky Way up to energies around 1017 electron volts only. Particles of higher energy have their origin outside of the Milky Way. The transition from galactic to extragalactic cosmic radiation is assumed to lie in the energy range slightly above 1018 electron volts, at the so-called “ankle” of the spectrum. According to the above theory relating to the formation of the knee, the transition to mainly extragalactic cosmic radiation is supposed to become visible in the energy spectrum of light primary particles first, as these are the first to leave their home galaxy. The identification of an ankle-like structure in the light component at relatively low energies favors theories predicting an early contribution of extragalactic cosmic radiation. “Future results of other experiments studying the spectrum at highest energies will show whether the high-energy light primary particles measured by KASCADE-Grande really are atomic nuclei from another galaxy,” says Sven Schoo, the KIT diploma student who analyzed the data. The recent results are published in the scientific journal "Physical Review D" Phys. Rev. D 87, 081101(R) (2013) (arXiv:1304.7114 [astro-ph.HE]). The astroparticle physicist Dr. Susanne Mertens is granted the 2013 Erna Scheffler Award. Every two years, the Karlsruhe Soroptimist International Club donates this award to young women at KIT for extraordinary scientific achievements. The award is named after the first female judge at the Federal Constitutional Court in Germany, Dr. Erna Scheffler, who emphatically spoke up for equal opportunities of women. Dr. Susanne Mertens was awarded for her Ph. D. thesis Investigation of Background Processes in the Electrostatic Spectrometers of the KATRIN Experiment written at the Institute of Experimental Nuclear Physics (IEKP). She made her Ph.D. thesis on background processes in the electrostatic spectrometers of the Karlsruhe Tritium Neutrino experiment KATRIN. This interdisciplinary experiment is aimed at determining as precisely as possible the mass of neutrinos that are elementary particles. For this purpose, interfering background processes have to be suppressed to the largest possible extent. 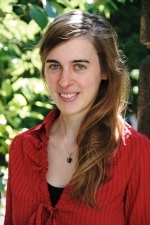 Together with computer scientists of KIT, Susanne Mertens developed a special simulation software to model various formation mechanisms of background processes, to predict their dimension and character, and to determine their effect on the neutrino mass sensitivity of KATRIN. To reduce background processes due to stored electrons, Susanne Mertens, in cooperation with electrical engineers, designed a new method that is based on the so-called electron cyclotron resonance (ECR). Mertens tested this method successfully in the KATRIN pre-spectrometer. Provided that this method will be transferred successfully to the main spectrometer, a nearly background-free measurement of the neutrino mass will be possible. On Saturday April 13, Kevin McCarthy, from the MIT group on behalf of the SuperCDMS Collaboration, has presented the blind analysis results of the largest exposure with silicon detectors during CDMS-II operation. The collaboration has previously published the results of the entire germanium detector exposure [Science 327, 1619 (2010)] which resulted in 2 events in the signal region and an estimated background of 0.9 events. Afterward, our likelihood analysis concluded that these were more likely leakage surface electrons rather than nuclear recoils. Increased interest in the low mass WIMP region motivated us to complete the analysis of the silicon detector exposure which is less sensitive than germanium for WIMP masses above 15 GeV/c², but more sensitive for lower masses. The analysis resulted in 3 events and the estimated background is 0.7 events. Monte Carlo simulations have shown that the probability that a statistical fluctuation of our known backgrounds could produce three or more events anywhere in our signal region is 5.4%. However, they would rarely produce a similar energy distribution. A likelihood analysis that includes the measured recoil energies of the three events gives a 0.19% probability for a model including only known background when tested against a model that also includes a WIMP contribution. This ~3-sigma confidence level does not rise to the status of a discovery, but does call for further investigation. If the result is interpreted as spin-independent scattering of WIMPs, a mass around 8.6 GeV/c² and a WIMP-nucleon cross section of 1.9E-41 cm² are favored. For the simplest theories of WIMP interactions and using the standard dark matter halo model, the allowed region is in tension with exclusion limits from the XENON collaboration. A paper has been submitted to the arXiv and to PRL. We will probe this WIMP sector with our operating germanium detectors in the SuperCDMS Soudan experiment, and we are considering using silicon detectors in future experiments. CDMS-II was funded by DOE and NSF in the US and by NSERC in Canada. For more informations: Super Cryogenic Dark Matter Search, NewsBlog. 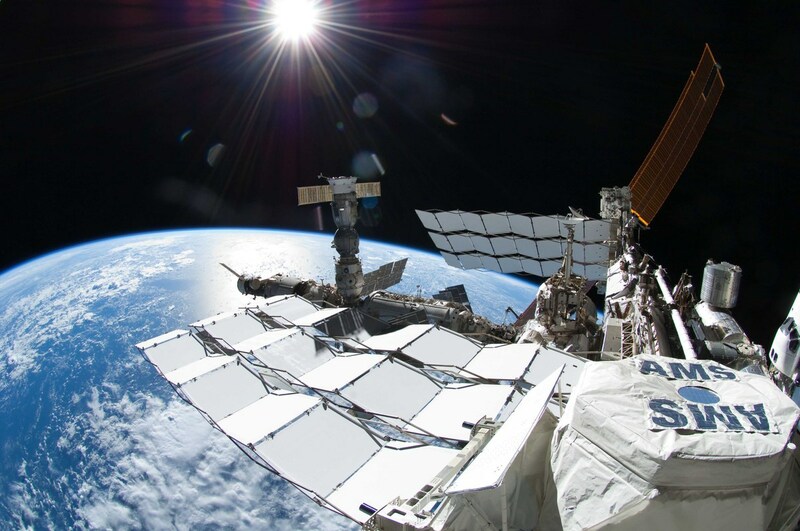 On April 3rd, 2013 the international team running the Alpha Magnetic Spectrometer (AMS) announced the first results in its search for dark matter. "Over the coming months, AMS will be able to tell us conclusively whether these positrons are a signal for dark matter, or whether they have some other origin." Prof. Samuel Ting, AMS spokesperson. See also, the HAP YouTube channel about dark matter. On 1st February 2013, the new Graduate School "Elementary Particle and Astroparticle Physics: Science and Technology (KSETA)" at KIT was officially opened with a grand celebration. This ceremony was attended by more than 200 people. The foundation of the school is based upon the successful application in the framework of the German Excellence Initiative in June 2012. One of the highlights was the dedication of the Julius Wess Award to Peter Jenni and Michel Della Negra for their outstanding contributions to the physics at the Large Hadron Collider (LHC ) at CERN (Geneva, Switzerland). As longterm spokesman of the two large-scale experiments ATLAS and CMS , repectively, both have substantial contributions to their construction and operation. Their work led to the discovery of the W and Z vector bosons in 1984 within previous experiments and now to the discovery of the Higgs boson at the LHC. Both scientists are closely associated with the KIT through the collaboration at the LHC for the past 18 years. 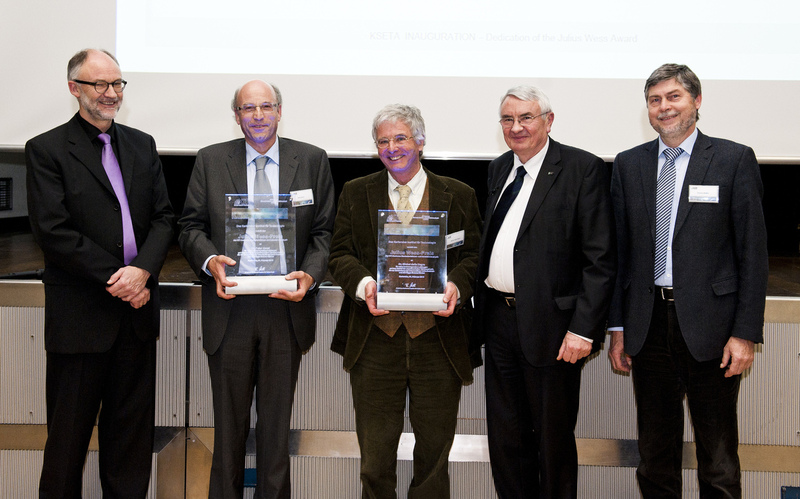 Top photo on the left (from left to right): Dedication of the Julius Wess Award to Peter Jenni and Michel della Negra (2nd and 3rd) with Prof. Blümer (1st) and Vice President Prof. Löhe (last-but-one) and with laudator Prof. Müller (last). Another highlight was the dedication of the honorary doctorate to the Nobel laureate James W. Cronin. He was honored for his outstanding achievements in the field of cosmic rays. His engagement led to the successful construction and operation of the Pierre Auger Observatory in Argentina, where KIT has a large contribution to the foundation and the operation. In the morning doctoral students presented the wide range of research topics of KSETA within the KSETA colloquium. The research topics range from the search for Dark Matter to theoretical and experimental particle physics at the CMS detector, through the construction of KATRIN and to the modeling and architectures for data-intensive science. 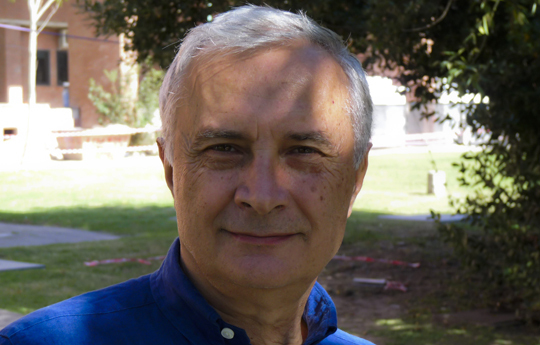 The director of the Institute for Detector Technology and Astroparticle Physics (ITeDA) in Buenos Aires, Professor Alberto Etchegoyen, is one of the nine scientists, whom the Helmholtz Association has awarded a Helmholtz International Fellow Award. 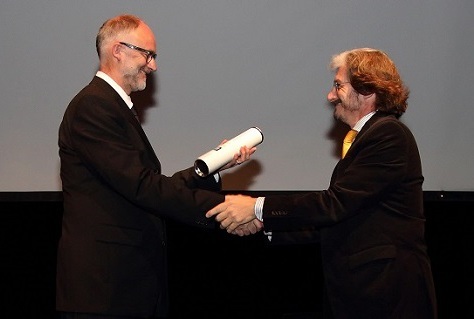 KIT recommended the physicists for this award of 20.000 Euro. This award also includes an invitation to conduct research in one or more Helmholtz Centres. Etchegoyen will be in the next two years and for several times a guest at the KIT Center Elementary Particle and Astroparticle Physics (KCETA). "Argentina is an emerging science and research place, especially for facilities working on astroparticle physics," says Professor Johannes Blümer, Spokeperson of KCETA. "The potential for cooperation is huge, as the international Pierre Auger-Observatory for Cosmic Ray has since 15 years awesomely demonstrated.“ KCETA wants to increase the exchanges with the institute of Alberto Etchegoyen and within the doctoral program at the Universidad Nacional de San Martin (UNSAM) in Buenos Aires.